WHAT IS IT? The days of girls scoring races with pencils and notepads are gone. Today, all Professional and most Amateurs races are scored by electronic transponders. It is basically the motocross equivalent of groceries being scanned at the checkout counter. Every time a bike crosses over the wiring buried in the track, the transponder sends that bike’s information to a computer in the scoring tower. It is clean, simple, fast and virtually foolproof save for dead batteries, lost transponders, computer glitches and riders who forget to put the transponders on their bikes. Dingo makes an inexpensive and unique transponder mount that snaps onto your fork stanchion. WHAT STANDS OUT? 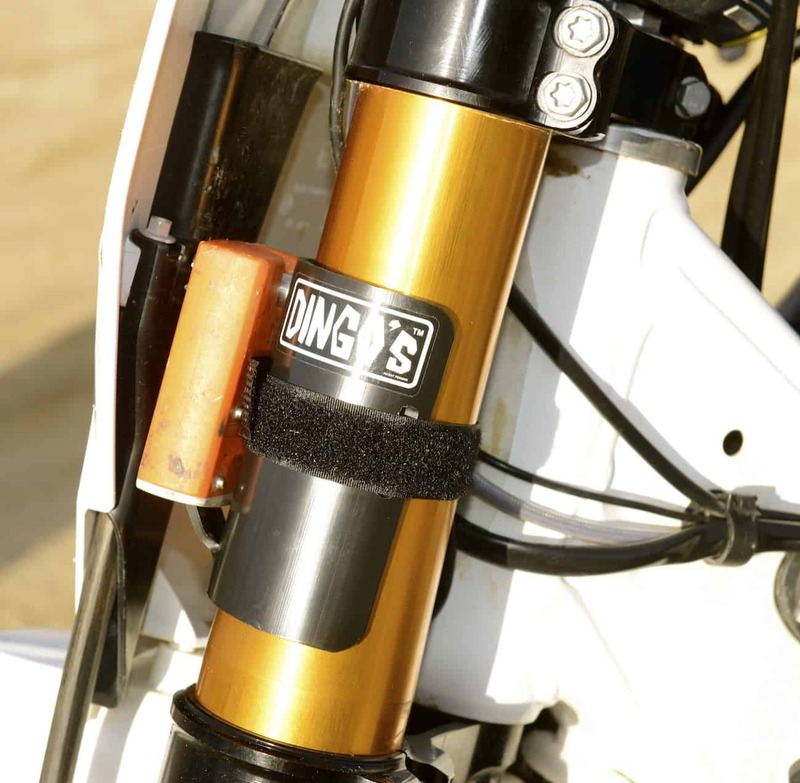 Here’s a list of things that stand out with the Dingo snap-on transponder mount. (2) Dingo design. 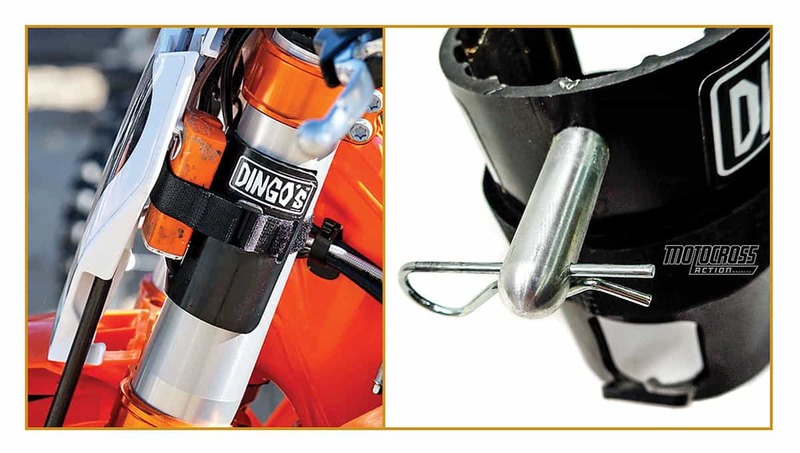 The Dingo transponder mount eliminates the need to use zip-ties or duct tape to keep your transponder from slipping, spinning or falling off. Plus, since it just clips onto your fork stanchion, you can move it from bike to bike or put it on either fork leg. The Dingo’s Velcro mounting strap is a very secure way to mount a MyLaps MX Flex (the orange one) or X2 transponder (the black one). The Dingo transponder mount is designed using solid modeling and made from extruded ABS plastic (Acrylonitrile Butadiene Styrene). Unlike PVC tubing, ABS combines strength and rigidity. The clamping pressure of the tube adds grip on the fork leg and is padded with a soft mat to keep your fork leg in perfect condition. An aluminum post is securely mounted, and a linchpin is included to keep your transponder in place. To install it, you simply pop the extruded tube over the fork leg, slip the transponder onto the post, and wrap the Velcro strap around the transponder and fork leg. The retail price is $39.95 (half the price of a carbon fiber snap-on transponder mount). (3) Installation. The Dingo snap-on transponder mount is a breeze to install. Just spread the tube apart and slip it over your fork stanchion. The transponder sits on a hook and slips over a post. A Velcro strap wraps around the fork stanchion and transponder to make sure that nothing moves. As far as the electronics go, it doesn’t matter which side of the bike you put the transponder on. 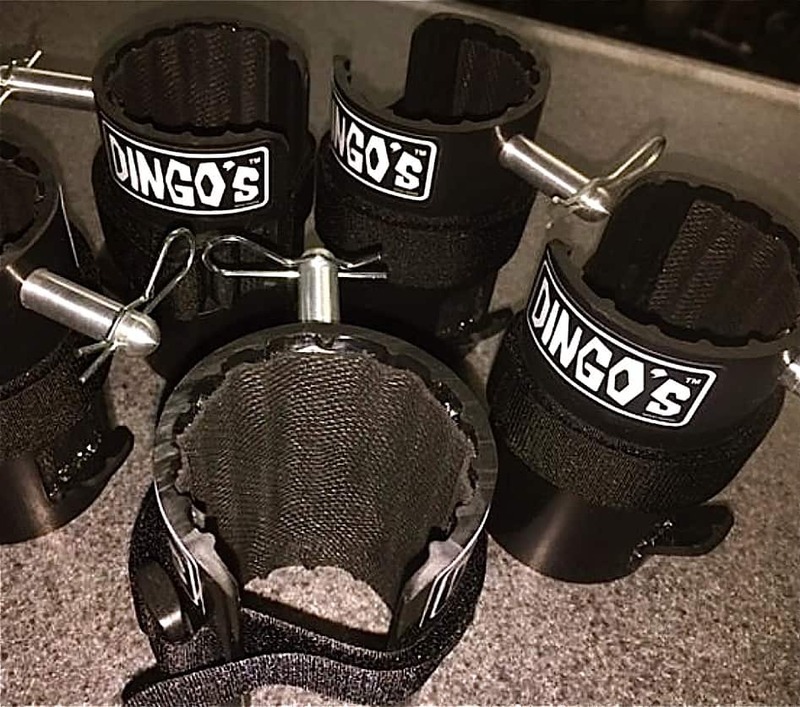 The Dingo unit can go on either side just by swapping the direction of the Velcro strap. WHAT’S THE SQUAWK? No complaints. When it comes to transponder mounts, we don’t want to have to mess with them. MXA RATING: The Dingo transponder mount isn’t a must-have, but it works well and is relatively cheap. If you’ve ever lost a transponder, you know how much they cost.